NPR's morning edition is starting a new series called Urban Frontier which will focus on cities. h/t to Metropolis Magazine for the tip. The City Vote: The Next American City has a story compiling the AP election data to see how cities voted in the primary. update: this data may be described as for cities, but its actually the voting results for metro areas fyi. Just for fun: h/t to Digital Urban for pointing out this grad student produced video representing life in the city. "Year by year our cities grow ever more complex and less fit for living. The age of rebuilding is here. The time to remould our old cities and build communities better suited to our needs." All that is missing is the slow fading text scroll into a background of stars followed by blaster fire. For those who do get through the first part. Here is the link for Part 2.
and while I know the PG had the whole "Next Page" devoted to him last week, I still wonder why he has been covered so much more outside of Pittsburgh than here. I wonder how many graduates his age from Pittsburgh Public Schools are fluent in Japanese and successful in any field in Japan. I think it would be a story if he were over there in most any profession, let alone making international news. His alma mater: Perry Traditional Academy, will be in the news for days because of a wayward teacher. I really think he deserves as much coverage. What Would Border Guard Bob Do? higher gas prices = longer weekend? Is there an upside to higher gas prices? Like maybe shorter work week to shrink the amount of commuting workers do. St. Francis University in Cambria County is implementing just that. See the story in the Tribune Democrat. Of course, other employers may shorten the work week and shorten the paycheck as well. Anyway, shorter work weeks or telecommuting is great is you are a wayward economist, but it's hard to cut back the driving for things like meals on wheels which are also being hit by higher gas prices. This all reminds me of the Port Authority route cuts last year. Now as gas prices are hitting $4/gallon, people are actually thinking about switching their mode of commuting. How many folks that might have switched to a bus last year can't now because their route was eliminated. The cuts were concentrated in the longer and, in the past, less used routes to the suburbs. Yet, those were the routes that really served the marginal transit riders which are most likely to switch to riding the bus as gas prices go up. The dense usage of bus ridership in city neighborhoods to Downtown and Oakland can't go up as much with gas prices because a higher percentage of those who can use transit already are doing so on those routes. So to cure (or is that partially cure?) the Port Authority's short term budget woes, the cuts implemented were precisely the routes that could be enticing new riders out of their cars and onto public transit right now. Maybe the Port Authority should be thinking about putting back some of those routes? But no, while most parts of the country is at least thinking of how to leverage public transit to deal with current energy costs, the only debate that is going here is over the drink tax (or hockey banners). Speaking of alternative commuting modes. I am not really proposing this particular vehicle as viable here, but the picture below was of a human power street vehicle literally parked on a Swiss street. I don't care if that frame was made of the latest carbon fiber, can you imagine trying to bike all that up a moderate Pittsburgh hill. Political wonks may be interested in general about this curious Politico article: FEC, media can't handle Obama jackpot, but I find it more interesting as a data-software story. It says it is remarkable that the Obama and then Clinton campaigns are collecting money from so many individual donors that the data collected by the FEC can't be redistributed in commonly used formats for Excel 2003, or Lotus 1-2-3. Is Lotus 1-2-3 really still in use? I don't find WordStar very useful these days either. what? You were looking for something about Kordell? King Coal Watch or Will the Web save the mining industry? How desperate is the coal industry for workers? Adfreak details an ad campaign designed by local ad agency Blattner Brunner (which as disclosure I consulted for briefly many years ago) to recruit miners for Consol Energy. The web site used for recruiting is online here, and really does not seem like the way to target future miners. The question then is whether this reflects the changing mining workforce? or the potential mining workforce of the future? or something else. The need for workers in mining is not surprising given the trend in energy prices all around, but the spike in energy prices is really setting the already tight coal industry on its head. Globally no less. From the NYT last week is this story on the revival of a long quiescent coal industry in Japan, see: As oil prices rise, nations revive coal mining in the NYT and IHT. If long closed coal mines are opening up in Japan, what does it say about what will be happening in Greater, greater Pittsburgh. Lots of coal as you head into the Pittsburgh countryside and beyond. The spot market for coal is actually defined right down the Ohio River (technically, about 107 miles down river, but close enough to be included in 'Greater' Pittsburgh) in the form of the Big Sandy Central Appalachian Coal Futures market as traded on the NY Mercantile Exchange (NYMEX). While it does not make as much news as say the daily spot price for oil, the time series for the Big Sandy Coal contract sure looks much the same, and has been frightfully meteoric in just the last couple months. What is interesting is that within the US it is Appalachian region coal that has seen the biggest price increases in the last 6 months going from under $50/ton in October to over $100/ton of late. In one sense, the spot market for coal is not as big an issue as oil prices because a lot of coal supply gets delivered as part of very long term contracts with the biggest users which isolates them from this short term volatility. Yet the converse of that is a bit scary in that it means any new contracts that get let at current prices are likely to lock in higher prices for quite a while. Add it all up and you get some interesting times for the local coal economy. It's both a regional and national issue, but also a very local issue as many communities have seen real impacts of coal price spikes in recent decades. It was probably a bit obvious, but most of the posts last week were pre-written. I did sneak in that obligatory post on Jero, but otherwise I have been away and mostly Internet-less, even TV-less for much of the last week. You know what I realized, unless you are deeply buried in the context, reading about things like 'banner-gate' come across as remarkably silly. In context, I understand it, but being out of the loop for just a few days made me wonder what the deal was and I have to believe most folks don't care enough about the machinations on Grant Street to really absorb much of it even when covered by the local news. Just too much other stuff to care about. But speaking of the Penguins. So here is me looking amazingly dour with my Pittsburgh Penguins cap on top of the Jungfrau mountain in Switzerland. I didn't really know I looked so glum. I will blame it on the lack of oxygen, but it sure does represent the mood in Penguins nation after the first couple games. Sad but true, it's the best picture I have with the Penguins cap which I soon thereafter accidentally left on a train speeding across Europe. I wonder if whoever found it realizes what a rare souvenir they have for that side of the pond. Hopefully it will be worth even more in a few days. Real estate is a disaster across most of the country for sure. From the other end of the state, but just today the main story in the Shamokin (Pennsylvania) News-Item is: Realtors: No Housing Slump Here. The view from Chicago Tribune today: Pittsburgh no longer built on foundation of steel. It's pretty short and is only of note really because they reached out and got a quote from author and historian and Pittsburgh-native David McCullough on the state of the Burgh. Most don't do that and you wonder why. I'd love to hear more from him on his Pittsburgh perspectives. But if you want a longer version of the Pittsburgh transition story, most already read this but it's interesting to read during the Stanley Cup this from another another of our Great Lakes brethren:Different City, Same Story, that the Detroit Free Press ran last month. Also from the Detroit Free Press today read about Dan Wholey vs. the Red Wings fan. and not something I would normally get into. Just because the media sometimes has a problem reporting on itself, this news that Mark Madden has been fired as local sports radio host is even odder and uglier than it appears. The facts of the current conflagration are clear enough. Why this is such news that the AP item on it even made it into the International Herald Tribune I can't really say, but his personal negatives within the media must be unspeakably low. Read this bizarre column Madden wrote just last week blasting the PG. What is odder is the rarely reported fact that Madden was for many years a sportswriter for the PG and even briefly had a column in the City Paper here. Seems like the PG wants to disown that little fact which is understandable, but it sure seems like it ought to be disclosed in stories about him personally at least. No matter, it's not like he is an unknown quantity to anyone. It's just strange to realize that any news you read on this you are probably getting from a former colleague or an outlet he used to work at. update: something I really don't fully understand, but the term "Mark Madden" has been #2 in the entire USA Google Trends list for most of the day. He sure is going out with a bang. See the Google Trends report for more. update2: and now the whole affair has its own article in at least the online Washington Post. See: Rightfully Let Go, But Not Soon Enough by Leonard Shapiro. There really has to be other news to focus on that this, does the world care that much? Memorial Day factoid: estimated number of Veteran deaths in the Pittsburgh MSA 2001-2010. Mentioned here earlier, but an obligatory post noting that the PG's Next Page section is devoted all to: Our Man in Japan -- Jero, aka Pittsburgh's Jerome White. It covers the Jero story pretty well and I may be the only one fascinated with the historical symbolism that Jero's Japanese nickname is Kurofune means Black ship and references Commodore Matthew Perry who compelled the 'opening up' Japan in 1854. It also is the actual namesake of the Perry Traditional Academy Commodores which Jerome actually graduated from before going to Pitt.... not Oliver Hazard Perry of the Battle of Lake Erie. Jerome also has his own wikipedia page. I'm sure his Japanese fans would love some early history that Pittsburghers could provide. Just a random neuron firing... but with the talk of Veepstakes rising on both sides of the aisle, just one name that I would not be surprised by on the D side despite nobody really talking about it: Kerrey... with two e's. Yeah, I know some of the obvious reasons it wouldn't work, but think through it a bit and it's interesting. Not a new photo, but this says it all. 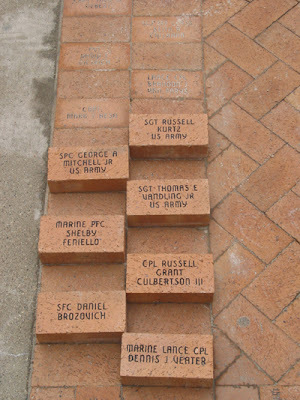 For Memorial Day on Monday - new bricks being staged at Soldier and Sailor Hall last year. Maps in History... I had no idea this was out there: 250 Years of Pittsburgh Maps. Just wondering what the status is of the court case over Allegheny County base year assessements that was sent to the State Supreme Court last fall. You have to wonder whether the Supreme Court really wants to throw asunder the property assessment systems across much of the state which is pretty much the result if they affirm Judge Wetticks ruling here. Like so many things in the region if you think this all started recently, think again. Planning and Government: Tax Increment Financing as an Economic Development Tool and Policy, from 2005. The only thing that is a bit odd in the Trib story, which probably reflects the URA analysis it is reporting on (and which I have not seen as yet) is that the only mention of former mayor Murphy is as an adjective of sorts desribing the "ex-Mayor Tom Murphy's doomed Fifth & Forbes master plan".. The rest of the article is if anything relatively positive on TIFs which is curious when you realize from the dates given that most TIF's ever created within the City proper were the creation of the Murphy adminstration, good or bad. So any analysis of current TIFs, which take years to put in place, let alone see any economic benefit of, must be a retrospective analysis on the Murphy policies. Not quite sure how to reconcile that statement with Funkhousers strong opposition to TIFs. If there is a place that has used a lot of TIFs its been the City of Pittsburgh through the 1990s and early 2000s. Maybe there is no connection, but it does deserve some study. So... I had an excessively long missive (sounds better than 'rant') on just how ridiculous the latest iteration of the Lamar/City Council/Billboard/lawsuit entanglement was last week..... but by the time I finished it even I didn't know what I was saying1. The bottom line is that there are no winners in any of this. It is hard to not find fault with just about every actor connected to the dysfunction of last week. What is more important now is what is all means going forward. Gotta start with Mr. Unintended Consequences. The whole billboard issue itself started out as a pretty serious hit on the mayor and it may wind up that way in the end. But if you ask my take on public sentiment right now, the billboard issue remains confounding at best to most and what happened last week in council is just completely incomprehensible other than it's all clearly bad. I really think that as a result of last week City Council is taking a much bigger hit with the general public than the mayor. Not sure if that was the intention of whomever generated the annotated Sirk blog archive so long ago. Blame that butterfly. That then becomes ironic given the coincident and nascent chatter that there is a mayors race coming up pretty quickly and the obligatory early handicapping. I myself have pointed out that were are just a few months from when serious mayoral campaigns would have to engage for the 2009 primary. Bob O'Connor was 3 (or is it 7?) years into into his winning campaign at this point 4 years ago. When you can describe the 5th floor last week as something akin to Machiavelli morphing with Barney Fife, the mayor's political situation for the week can be summed up as: With opponents like these, who needs friends? Or as our friend RichL may have once scored the week, a muffed snap in the end zone scores the safety 2 so LR: 2, opponent to be named later: 0. If that video does not work, try this link. 1. So yes, what follows is the shorter version. Why do we have primaries in the first place? With the primary season more and more agreed to be over with.... I still think its interesting nobody ever asks much why the US alone has such a strange primary system. It's a question we used to ask ourselves according to this piece from the archives of the New York Times "Direct Primary in Operation: So far is has failed ot meet expectation", by Professor Henry Jones Ford of Princeton University, April 19, 1909. I wonder if even the Obama campaign would agree to some degree at this point. More on the financial crisis in Jefferson County, AL: Jefferson County OK's Forebearance Extension. Why care? It's interesting for lots of reasons. The debt in Jefferson County is higher than for the city of Pittsburgh for sure, but when you add up all debt and work it out per capita you get some more similar or worse numbers. Also in that article I see that some of the debt is causing them problems is because they were issued in the auction-rate securities that caused UPMC such problems recently. I still wonder when the bond holders, bond insurers, and reinsurers will become part of the mix in the city's Act 47 process here. Now tie the city's debt issue with the story yesterday of natural population decline and you can see where some real issues will be in local public finance, here and elsewhere. In the NYT today with a dateline of Pittsburgh of course: As Deaths Outpace Births, Cities Adjust, by Sam Roberts and Sean D. Hamill. But looking forward is a different type of story. Here is a graphic I sometimes point out to folks. From where we are at already and projecting out, there are places that are expecting to see some really phenomenal increases in their elderly populations. By state the projected percentage increase in the elderly (age 65+) population between 2000 and 2030 by state looks like this. And if I were put the Pittsburgh region into that graph, it would come in a full third lower than Pennsylvania overall depending on what you are defining as the region. Here is something from ABCNews biz columnist Rick Seaney: “Mother of All Capacity Cuts”, Which Cities Have Lost the Most Air Service. Pittsburgh islooking pretty bad in his calculation of anticipated air service cuts by this coming fall (-22%), but actually less than Ontario (-25%) fwiw. The $370 million first-lien term loan for casino operator PITG Gaming was oversubscribed Monday after the discount was lowered to 94 cents on the dollar from an original issue discount of 96. The company's $250 million second-lien term loan was flexed to 92 from an OID of 96; but the tranche was only half subscribed by last Tuesday and having difficulty attracting investors, a portfolio manager looking at the deal said. lead arranger Credit Suisse launched the first lien and second lien, along with a $100 million revolver, April 18. Pricing on the first lien was initially LIBOR plus 6% with a LIBOR floor of 3.25%. The second lien was priced at LIBOR plus 10% with the same floor. The loans are non-call for 18 months, after which there is hard-call protection of 102, 101. The financing backs the construction of the Majestic Star Casino in Pittsburgh, Pa. Jon Bennett, cfo and treasurer, did not return calls. What does that mean? LIBOR +10% puts you at around 16% these days which is pretty unfavorable as these things go and remarkable when you go back and look at some of the early financial analysis of a casino license in Pittsburgh. This one assumed a cost of capital in the range of 6-10% and by 10% the profitability was getting pretty shaky. At 16%, there must be an implict assumption on Barden's part that he will refinance lower as soon as the prospects for a profitable operation are a little more secure. It may be a bit boring for many, but given how big a deal this all is in town, you would think there would be story just in these interest rates he is being forced to offer to get his financing. That's a huge issue all around even if he gets all the funding he is looking for. It's too easy an explanation to just say race explains a lot of the election results, even considering the lopsided WV results. From the Newhouse News Service is something that may do a more thorough job at explaining a lot of things, not just the election results of late. See today's piece: Obama's Appalachian Problem by Jonathan Tilove. Might also portend the VP slot, but who knows. (Please pay at the door, by cash or by check made payable to “The Economic Club of Pittsburgh.”) RESERVATIONS ARE REQUIRED. (that means call now). Please make your reservations by email to reservations@econclubpgh.org no later than May 16, 2008. If you find that you cannot attend or arrange for an associate to attend, please cancel by May 16th or you will be billed for the cost of the luncheon. Please call (412) 762-2671 for cancellations. Steel Forging Ahead... Steel rails that is? JasonT caught something worth noting. Transrapid, which is the company whose technology was long going to be used for the ethereal Pittsburgh MagLev has decided to dissolve itself. What that means here I dunno, I have not talked to anyone working on our Maglev project in many years now. As of earlier this month, Grata was reporting on Transrapid as still being in the mix. via SteelStripWorld is a pointer to this article in the Chicago Tribune on the state of the Steel Industry: In hard times, steel firms forge ahead. This kind of thing used to be news here? The share price of US Steel has gone from under $10 to over $170 in the last 5 years. The Case of Deborah Rice: Who Is the Environmental Protection Agency Protecting? Quiz: What is closer, the Grove City Outlets Mall or West Virginia? This primary season has gone on so long that for media and public alike I wonder if there is any objectivity left. For an outsiders perspective on the West Virginia primary today, the Financial Times yesterday does not dance around anything in: Democrat country keeps its distance from Obama. News is that the Philadelphia experiment with city Wi-Fi service is on the verge of collapse. Given that general trend across the country, and given the circuitous route of Pittsburgh's Downtown Wi-Fi... you have to give some credit where due. However they have done it, the free Downtown Wi-Fi was still working pretty well. Does that count as something else we are beating Philly at these days? Some years ago I said Goodbye, St. Francis. Now that we are exactly a year away from the opening of the new Children's Hospital in Lawrenceville on the same site, it may be time for a sequel welcoming the new hospital to the neighborhood. Just one of those things that makes Pittsburgh Pittsburgh... and something that the Trib and PG will agree on to boot. Read about Kraynick's Bike Shop in Garfield in the Trib or take a look at the 360 Photo in the PG a few weeks back. It really does look like that inside and you really will be encouraged to make your own repairs in the shop. FWIW.... it looks like Don Barden is moving ahead and getting the financing he needs. Read more. Posted before, but this is the most complete History of Hockey in Pittsburgh that I have ever read. What is interesting is that the author is pseudonymous. Maybe the viewers of that particular forum know who the author is, but how would you cite this work? It does claim to use (with permission) some material from this Ed Bouchette story. Not our Penguins... but too Funny: Penguin Bloopers. KDKA-tv has picked up on the story of former Pittsburgh developer Bernard(o) Katz's flight to Brazil in this story: Tycoon Flees To Brazil, Leaves Renters In Lurch. I am not quite sure how to describe Mr. Katz, but "tycoon" seems a bit Monopoly-ish to me. It's also old news in a sense. Speaking of old news... looks like somebody has noticed that since casinos have opened up across the state, bingo revenue has edged down. Who would have suggested that as a possibility? I thought several casino's have yet to open. As for suggesting things. Oil is now over $123 a barrel. It's strange to realize that $100/bbl was pretty inconceivable not very long ago... Again, who would have suggested that oil could actually reach $1?0/bbl. Now some folks are saying $?00/bbl. I see in the news that the aftereffects of the billboard issue are still rippling across the 5th floor. Think this is over with? Not a chance. Think this all started a few months ago? The NYT seems to have a scoop that a former New England Patriots assistant is providing the NFL with videotapes from 8 games including the 2002 AFC Championship with the Steelers. What I want to know is what ever happened to the accusation of irregular frequencies being used by the Patriots. It was an issue that just disappeared without explanation. For my longer thoughts on that see: Belichick's Puzzle Palace. Also, I wonder who was "Deep Zone". Not trying to prejudge anything myself, but the news seems to really be saying the Democratic primary season is ending. If so then it is now time to look toward the fall and just about the coolest political graphic I have seen. I have posted this before, but for anyone with an inkling of interest in political history needs to check out the New School's Parsons Institute for Information Mapping (PIIM) Voting Tool. You really need to try it out by launching the application (click on the map on the left of the intro page). It has different types of presentations of presidential electoral results, some that I have yet to figure out. It also allows you to play with counterfactual outcomes by state to see how different elections could have turned out. It also has electoral results going back to the birth of the Republic, as they say. Yes, I'm jealous. Someday (long in the future) I will do the same for local elections. That toe is almost in the water, the city council in Vallejo, CA has at least voted to approve a Chapter 9 bankruptcy filing out there. If I had to guess, Federal court will not let them go that far, but we will see. Down in Jefferson County, AL it is the bond insurers who are proposing that a fee be imposed on households who don't use their sewer system to help pay for the sewer debt down there. That ought to go over well, but what is more interesting is how the bond insurers are actively engaged in their public discourse down there. The insurers are the ones scrambling because at least in part it is their problems that have led to big increases in financing costs going up for Jefferson County. I literally do have a news filter set up specifically for Chapter 9 bankruptcy filings. It's typically pretty sparse, but has been filling up of late. A smaller scale for sure, but here is one about a bankruptcy filing in Gould, Arkansas. Just given how rare Chapter 9 bankruptcy filings are, maybe a handful a year at most in recent decades and most of them pretty small places, it just makes you wonder. Here are some dots to connect. While Chapter 9 bankruptcy is more concerned with cash flow than assets/debts this is still an interesting comparison: Vallejo has 117K residents and if I understand the the article linked above it currently has a general obligation bond debt of ~$60mil. The city of Pittsburgh these days has say 305K residents (a bigger % of whom are students or elderly than in Vallejo for sure) and a general obligation bond debt alone of ~$850mil. I leave the division to others. and that does not begin to address pension liability and is just the City's debt... so it does not include things like the Water Authority's debt nor any other revenue backed debt. A must read is the Guardian's Free Our Data series. Their latest appears to be an attempt at crowdsourcing investigative journalism. See: You Too Can be a Citizen Journalist. Their topic is a bit wonkish: obtaining mapping data that the UK government must provide for a fee, but that may be a strategic decision. If that works, who knows what they may work on next. For the good folks at the PG and Trib or elsewhere, maybe its time to stop reacting to bloggers and move beyond being the Tail that Wags the Blog. Just my 2 cents. OK... without opening your freezer or asking Mr. Google, what is your answer to this question: How much does a typical supermarket ice cream container hold? If your answer is a half gallon you are way behind the times. If you didn't notice, the long standard 2 quart ice cream container begot the 1.75 quart container more than a few years ago. Now we are talking 1.5 quarts!! Read more from the Consumerist. Calling all food editors!! Hey, this is important stuff. Research is needed to see if this implicit inflation has reached the Burgh yet. Just to support your local public radio station (or one of them), you can hear some of my blathering on the history (and future?) of immigration in Pittsburgh in this segment which ran this AM on WDUQ: Pittsburgh's New Immigrants. For some real historical context, here is a page I scanned from the 1910 census which shows a remarkable factoid. If you work it out, at the time over 40% of the men (age 20 and over) in the City of Pittsburgh were foreign born. For more on the international theme. If you know your German here is a clip that ran just before the primary on German Public Radio that was mostly focused on Pittsburgh. Gebeutelt von der Globalisierung Wirtschaft dominiert Pennsylvanias Vorwahl. and could you come up with a better addendum to all that. First the Spanish buy Kennywood and now the French are buying Yellow Cab. I can't wait to see what Messrs Carbolic do with that little factoid. No reason, just neat: See the Map of Creativity by the Next Generation Foundation. Assuming the casino does open up someday, you will want to read the gambling industry's definition of the term "extinction". I don't want to mitigate the story today that Pittsburgh's air is bad. But still, take a look at the ABC news report on this and what do you see? First the picture is of Three Rivers Stadium. and the picture they clearly chose to illustrate our smog problem was quite a foggy day. So again, its not meant to deny the issue at hand, but come on? They have a lot of comments to that article. worth a read. I'll just append this here... there is a lot of coal related news today. See this press release that says a lot about competition for coal workers these days. That and it looks like US Steel is going to give out some more details this evening on their planned investment at the Clairton Coke Works. Us here in the Birmingham of the North should keep watch on the doings in Alabama. Still waiting for info to leak out of the proposed financial deal for Jefferson County, Alabama to avert bankruptcy. See this from Bond Buyer last week: Jefferson County Remedial Plan Under Wraps. Bond Buyer also has a piece today focused on Pennsylvania and transportation infrastructure funding. See: Transportation in Trouble. Ok, it's not the top 10 or anything.... but Pittsburgh is ranked 60 out of 296 metro areas in this months Fortune Small Business Magazine for . See what they say. The criteria for all this was the "best mix of business advantages and lifestyle appeal." So a smidge out of the top quintile isn't so bad.